Whether your preference is country classic, beach cabin or simply modern contemporary you can bring your architectural design to life and make the country your home. 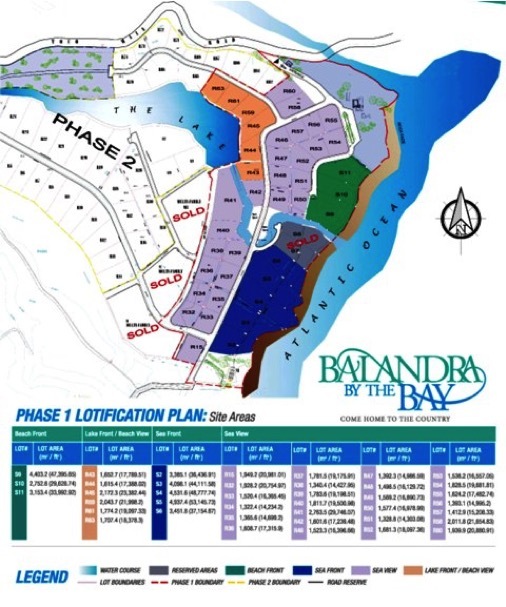 Your very own Private Paradise waits in beautiful Balandra by the Bay, which is an exclusive gated community located on the north east coast of Trinidad. Occupying over 35 Acres in the lush hills of the Balandra coast, each parcel of land has its own breathtaking view of the Atlantic Ocean. This one of a kind residential development combines nature with modern day amenities, complete with 24 hour security, safe for walking and jogging, its own private lake and nature trails with full access to one of the most beautiful and soothing beaches on the coast. An ideal environment for residents to experience the luxuries that life and nature has to offer. Lots are leasehold for 999 years. There are no time restrictions for construction. Beach Front, Lake Front Sea Front and Sea View Lots of varying sizes and prices are available. Lot sizes range from 17,388 to 47,395 square feet, and prices range from TT$100 to TT$175 per square foot. Come Home to the Country!